LeTourneau University's Department of Humanities and Social Sciences, in partnership with Ezra International and Ministry to Israel, is hosting a free, public event titled "Remembering the Holocaust" on Wednesday, April 11. The event will include guest speakers and a special exhibit from 8:30 a.m. to 2 p.m. in the Belcher Center on the LETU campus, 2100 S. Mobberly Avenue in Longview. "The Holocaust was committed by ordinary men and women, in the worlds of Christopher Browning," said Daniel Ostendorff, LETU assistant professor of history and organizer of the event. "For most Germans, the mid-1930s were a time of prosperity in the midst of the Great Depression. For millions of others, however, it was the beginning of some of the darkest days in human history, when other groups, particularly Jews, were stripped of their citizenship and became targets of an entire nation's efforts to wipe them off the face of the earth." The Holocaust remembrance event will feature guest speaker Dr. Carrie Burns, an international liaison who speaks on topics of the Holocaust, anti-Semitism, Zionism, Jewish-Christian relations and the state of Israel. She has worked at Yad Vashem in Israel and at Auschwitz-Birkenau's Holocaust Memorial and Museum in Poland. Her first presentation from 9 to 10 a.m., "Heart of the Holocaust" will be an overview of the Holocaust, providing the context for the day's exhibits and sessions and observations on the legacy of the Holocaust. The second session from 10:50 to 11:30 a.m. is "Dachau: A Survivor's Story," featuring Vicki and Richard Hornok, the daughter and son-in-law of Holocaust survivor Alexandra Goode who endured the Dachau Concentration Camp before immigrating to the U.S. in 1948 at the age of 18. The Hornoks will tell her story. The third session will be from 12:45 to 1:45 p.m. in the Education Building, Room 117/120 where Burns will speak on "Auschwitz: More than Darkness" reflecting on the camp where more than one million Jews were killed during the Holocaust. 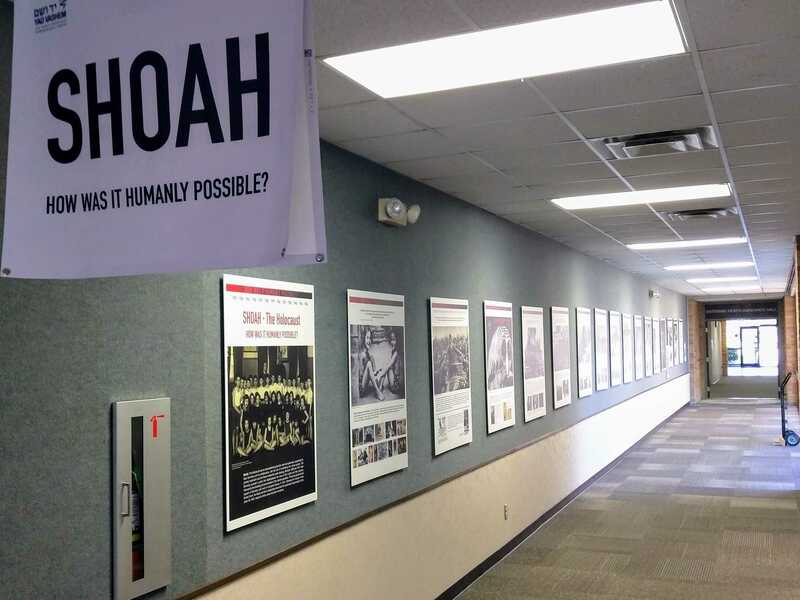 A traveling exhibit, "Shoah: How Was It Humanly Possible?" will be on display presenting an overview of the key historical developments of the Holocaust. The display, on loan from Yad Vashem, the World Holocaust Remembrance Center in Israel, will be on the display in the Belcher Center Grand Lobby the day of the Holocaust Remembrance Day. The traveling exhibit is also open to the public from April 2 through 13 in Longview Hall on the LETU campus. Guests are encouraged to view the exhibits during the lunch hour and are also welcome to 1) bring their lunch, 2) purchase lunch a la carte from the university's student center Hive, or 3) dine at the the university's Corner Café buffet for $8 per person including drinks and dessert. Burns has been a worldwide advocate for Jewish-Christian relations for over 25 years. She speaks around the world at universities, churches and synagogues on topics including anti-Semitism/anti-Zionism awareness, Jewish-Christian relations, Israel and Aliyah. In addition to a PhD in Education and further training at Yad Vashem Holocaust Museum in Jerusalem, she recently lived in Oświęcim, Poland for four months to volunteer at Auschwitz-Birkenau Holocaust Memorial and Museum. She serves as the International Liaison for both Ezra International and Ministry to Israel, which assist the Jewish Agency and Israeli Consulates by helping Jewish families emigrate to Israel from places such as Ukraine, Siberia, and Muslim nations, and then provides humanitarian aid both traveling to and within Israel. Vicki and Richard Hornok tell the story of Vicki's mother, Alexandra Goode, a Holocaust survivor of Russian descent who was born in 1929 (the same year as Ann Frank) yet was raised in Yugoslavia because her family had to flee Russia during the Russian revolution. Hitler's hatred for Russians was only surpassed by his hatred of the Jews, so when she was orphaned and homeless in the early years of World War II, Vicki's mother was sent to a concentration camp then a labor camp. After the war ended, she immigrated to the United States at the age of 18. She married her husband, George, in 1950 and together they have helped facilitate the adoption of 250 Russian orphans over the years. Vicki, is a graduate of Baylor University and is founder and director of Sentry Soft Solutions, an IT company that provides software for community corrections facilities throughout Texas. Richard holds a master's and doctorate from Dallas Theological Seminary and is the senior pastor of Fellowship Bible Church in Texarkana. The Hornoks have seven children, and two grandkids with two more on the way. For more information about the event or to inquire about bringing a school, civic, or religious group to the event, please call the LETU history department at (903) 233-3394 or send an email to history@letu.edu.